You can extend your lending period for a digital title by renewing it. You'll see the Renew option for a title on your Loans page (under ) three days before it expires, as long as there are no holds. If the title has holds, you can't renew it, but you can request it again. In your library's digital collection, select to go to your Loans page. 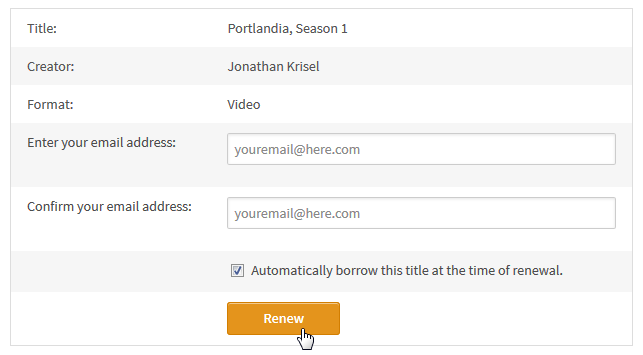 Select the Renew button under the title you'd like to renew. Choose an option for the length of the renewal (if available). Then, tap Renew again. Note: Any time left on your current lending period is canceled when you renew a title. For example, if a title expires in two days and you renew it for seven days, the new due date will be seven days from the moment you renew. After you renew the title, you'll see the new due date and options to open or download it. If you downloaded the title to the OverDrive app or your device, you'll need to download it again to apply the new due date. 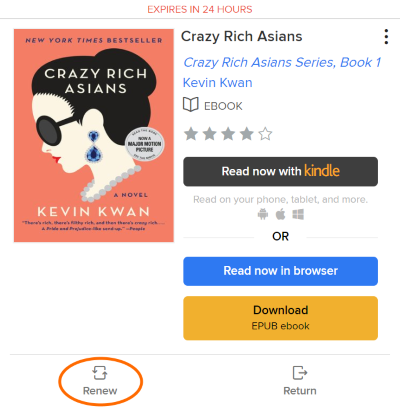 If you sent the title to Kindle (U.S. only), you'll need to return it from your Amazon account, then send it to Kindle from your library again to apply the new due date. 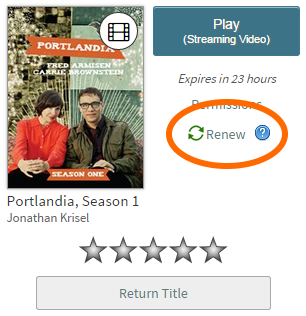 Renewing digital titles works a little differently than renewing physical books from the library. When you renew a digital title, it doesn't extend your lending period; instead, it lets you borrow the title again immediately after your current checkout expires. The Renew option becomes available three days before a title expires and appears next to the title on your Checkouts page (under your Account). If the title already has holds, you can't renew it, but you can request it again. Note: Some libraries may not offer the Renew or Request Again features. Sign into your Account on your library's OverDrive website. Note: This link will appear three days before the title is supposed to expire. Enter and confirm your email address in the renewal form, then select Renew. 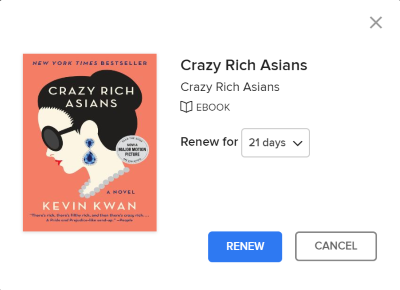 If you want the title to be automatically borrowed again for you as soon as your current checkout expires (instead of being held for you on your Holds page), make sure that "Automatically borrow this title at the time of renewal" is selected. Once you renew a title, you will see a checkmark and the word Renewed next to that title on your Checkouts page. You can also see which titles you've scheduled to renew on your Holds page. As soon as your current checkout expires, you'll receive an email with instructions on how to access the title again. You'll either be instructed to find the renewed title on your Checkouts page (if you had it automatically borrowed for you at the time of renewal) or to borrow the title again from your Holds page. Please note that renewing a title does not mean that it is automatically re-downloaded to your computer or device. If you'd like to re-download your renewed title, you'll have to go back to your Checkouts page and download it again.